ST. JOSEPH COUNTY — Flooding is still a concern for many homeowners. 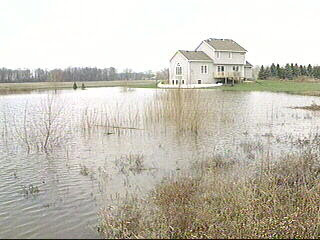 In St. Joseph County, an overflowing pond is threatening homes. It’s been a stressful couple of days for about a half dozen people in the Heather Lake subdivision. The heavy rains and melting snow made for a dangerous combination, and one neighbor told WSBT News he wasn’t going to take any chances. “Another six inches and we probably would have had been standing in a little water right now,” Kois told WSBT News. Neighbors knew they had to act fast. They used a park bench, which is now under water, as a way to gauge how fast and how much the water was rising. To help get the water out, the developer put in a pump system. Neighbors also took action. They put up sandbags around their homes to keep the water from getting too close to their foundation.